18 Jan What Lead Code do I need for the lead work on my roof? When you are having a roof built, it is essential that it is constructed to the highest possible standard. This is because you are relying on your roof to keep your home warm, dry and safe, and protect it from water damage, which can cause major structural problems. As a result, there are certain standards which must be met when a roof is being built, including in the products that are used to make your roof. Here we take a look at Lead Codes, which are an extremely important element of roof construction. What are Lead Codes and why do they matter? Rolled lead sheet is a material which is widely used in roof construction, but it is available in a wide variety of thicknesses. Different thicknesses of lead sheet are suitable for different jobs on a roof, and different types of roofing require different lead sheet thicknesses. This means that before any roofing job can begin, your roofer will have to look at the roof and determine the right thicknesses of lead sheet to use. 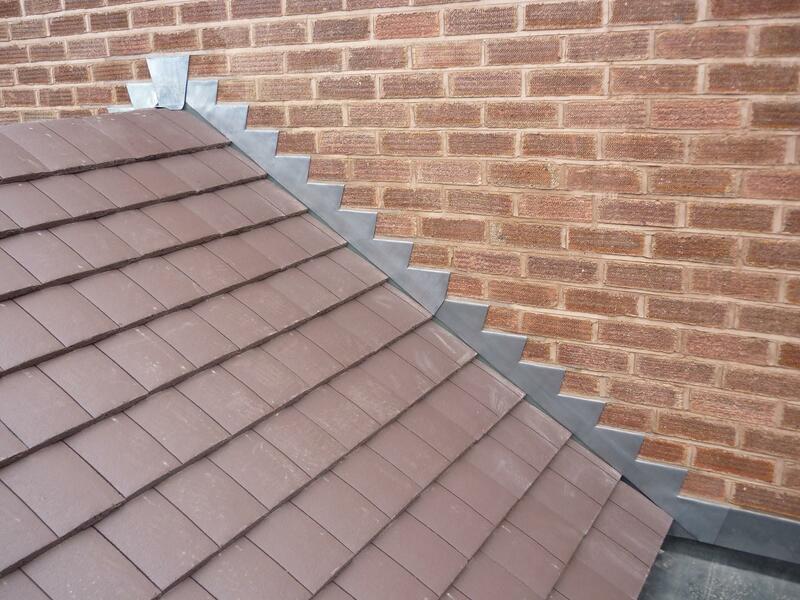 It is absolutely vital that your roofer gets this right. If the lead sheet used is too thick, this can cause structural damage to your home, as the weight of the lead sheet will be too heavy for your roof to hold. Using the wrong thickness can also affect your roof’s ability to deal successfully with changes in temperature and weather conditions. The roof has to be a complete structure in itself, with every element working together to keep your home safe, well-insulated and protected from all weathers. Because of this, using the right thickness of lead sheet is essential if your roof is going to last for the required length of time. It also affects the appearance of your roof, so the right thickness of lead sheet will produce a roof which you will be happy to look at for many years to come. To make it easier for roofers to select the right thickness of lead sheet for each job, each thickness has been given its own code under British and European Standards (BS EN 12588:2006). These are known as Lead Codes, and it is essential to know which code is suitable for which job, so you can ensure your roof has been constructed correctly and is built to last. 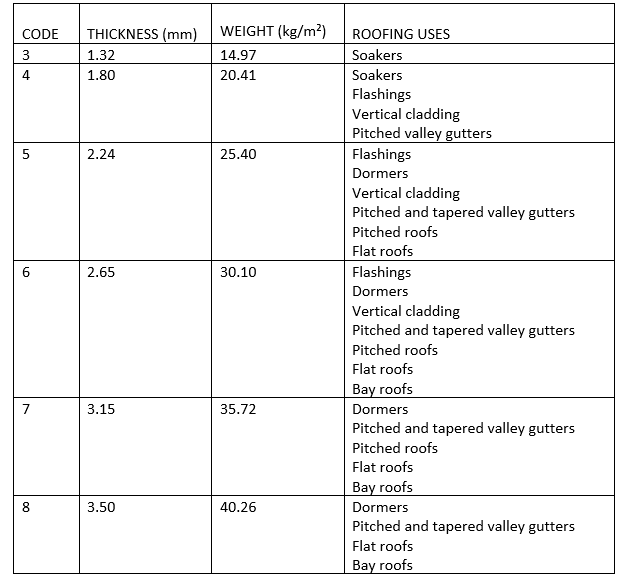 To make it easier to understand the various Lead Codes, we have put together this table explaining what each code means, and which types of roofing jobs each thickness of lead sheet is suitable for. By sticking to these codes, and only using the correct type of rolled sheet in the appropriate ways, you can ensure that you are creating a roof which offers the right protection to the rest of the building, and looks attractive and in-keeping with the property. Please be aware that roofing is a job which should only ever be attempted by a qualified and experienced professional. Roofing involves specialist skills and equipment, as well as working at height, so tackling it when you are not sure what you are doing can be highly dangerous. It is always best to leave this complex job to someone who has significant experience, the right equipment, and the right insurance. If you need a new roof built, and would like a consultation and quote from a highly experienced professional roofing firm, please contact us here at Roundhay Roofing. We would love to add you to our long list of satisfied customers, and our specialist, friendly team are always happy to discuss your specific requirements with you.